Penge 1982 by unknown artists. Household. The pink pub picture in Penge! There are only a handful of old murals left in London and Penge has one of them. 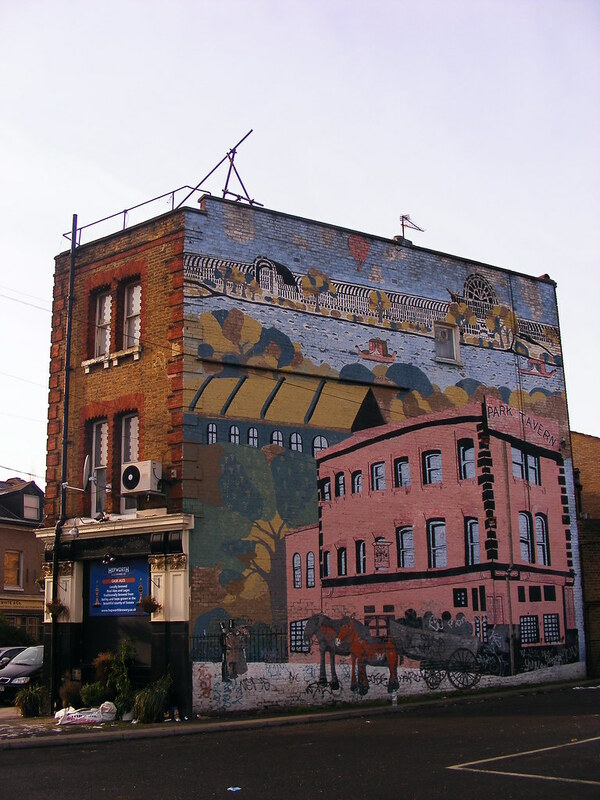 Located on the back of the Hollywood East pub, formally called the Park Tavern, is a mural of a Victorian scene depicting the pub, the Crystal Palace at Sydenham Hill, all set amongst the fields and industry of south east London. From far away the mural design is strong, and it not until you get up close that you realise how crude the figures and buildings are. The fact that it works from a distance suggests that the person overseeing the design work knew what they were doing. All the buildings are drawn with some sense of perspective. The representation of the pub and the horses, leads the eye through the painting up to the background of trees and palace. The mural was painted in 1982 by the Coal Yard Youth Group and the Orchard Lodge Regional Resource Centre, a children's secure home that closed in 2009. The mural must be loved locally, because apart from a bit of tagging, the piece hasn't been removed when the pub changed hands. Let hope it stays around to remind us what great projects can be done with young people! We are currently researching the history of this mural. If you can help, please do get in touch. The mural has some bad tagging at the bottom but generally has survived well. From Penge East Station, head towards the main entrance and car park. The mural faces onto this area.